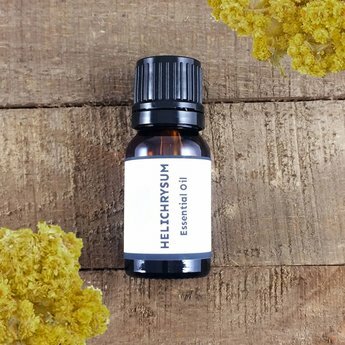 Our Helichrysum (Helichrysum italicum) essential oil is herbaceous and buttery with rich, sweet, warm, minty, honey-like notes. This relaxing oil is mood uplifting and reviving. One of helichrysums most beneficial properties is to reduce swelling and bruising. It also is supportive to the regeneration of cells and tissue making it a great oil to heal small abrasions and burns. Direct Palm / Nasal Inhaler: Place a drop of oil in the palm of your hand, gently rub the hands together, cup your hands around your nose and take a deep breath in through the nose. You can also add several drops to nasal inhaler and breathe in throughout the day. You can repeat multiple times though out the day (for stress add rose). Diffuser: Helichrysum is a wonderful oil to add to a diffuser to sooth the nerves and calm the heart (add rose or clary sage). To help heal a burn apply straight to skin. For skin regeneration and repairing scar tissue blend helichrysum with carrot seed, mandarin and rosehip seed oil and apply to affected are at least 2x daily. Chamomile, clary sage, clove, lavender, lemon, mandarin, neroli, rose, sweet orange. There are over 600 species in the Helichrysum genus throughout the world. The name Helichrysum is derived from the Greek helios (meaning sun) and chrysos (meaning gold), referring to the color of the flowers. Helichrysum has been used since the time of the ancient Greeks, who often used it after battles. Cautions: Non toxic, non-irritant and non-sensitizing.